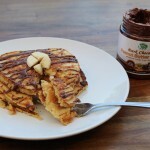 Delicious, low carb dark chocolate peanut butter banana pancakes! Follow instructions on LC-Banana Pancake Mix package. Warm ¼-1/2 cup LC-Dark Chocolate Peanut Butter spread in the microwave.